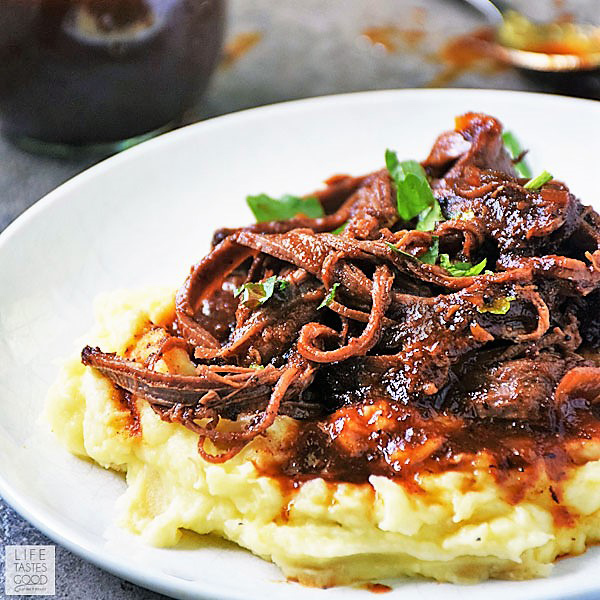 Beef Brisket cooked in a slow cooker with a homemade, tangy BBQ sauce and served over creamy, garlic mashed potatoes is one of my favorite comfort food recipes. Comfort Food is different for everyone, but one thing is true, when you get home from a long day it's nice to be welcomed by the aroma of a home cooked meal ready to serve up and enjoy. With that in mind, the Sunday Supper Tastemakers have been busy in the kitchen recipe testing our favorite slow cooker comfort food recipes. You'll also want to check out Life Tastes Good's collection of slow cooker recipes. 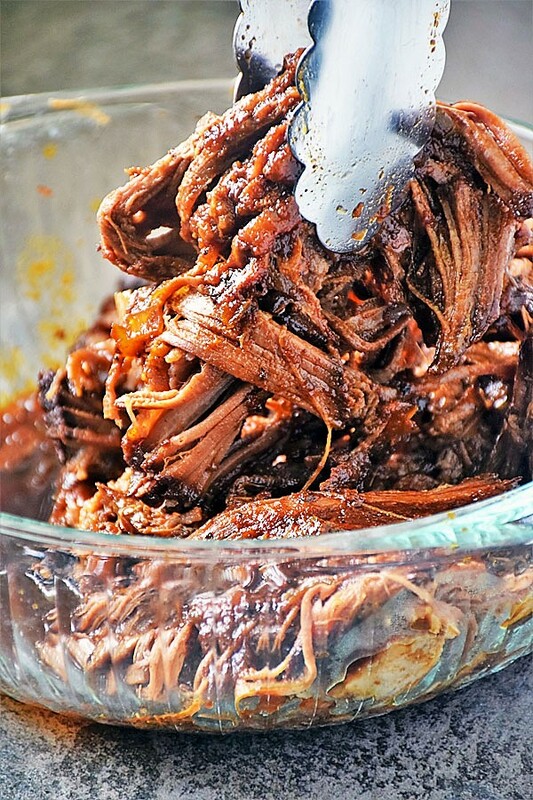 This recipe for BBQ Brisket is easy to prepare and we always have leftovers that I like using for meal planning throughout the week. 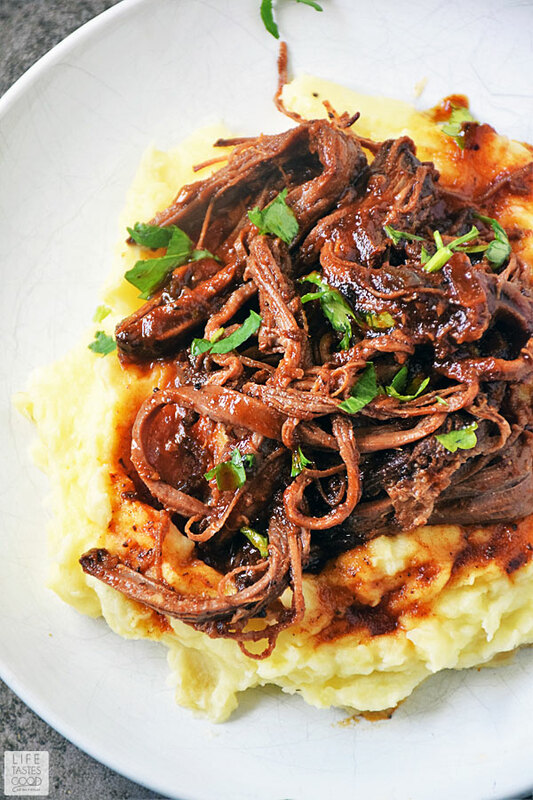 The leftover brisket is super versatile. It makes a great BBQ Brisket Sandwich, it's delicious in soups, and we love it in my recipe for BBQ Beef Brisket Rice Bowl. Perfect for making on a Sunday and using in recipes throughout the week for a variety of meals. For maximum flavor and tenderness use Certified Angus Beef® brand brisket. If you are unsure of where to purchase this brand, click here to search for a dealer near you. This recipe needs a good 10 hours in the slow cooker, so I like to put this in overnight and then keep warm until ready to use or reheat as needed. It tastes just as good, if not better, reheated. Place 1 cup ketchup, 1/2 cup brown sugar, 1/2 cup water, 1/4 cup diced onion, 3 tbsps cider vinegar, 3 tbsps worcestershire sauce, 1 minced jalapeno, 4-5 whole garlic cloves, 1/2 tsp salt & 1/2 tsp pepper in the slow cooker. Mix together 1/8 cup paprika, 1/2 tbsp chili powder, 1/2 tbsp ground cumin, 1/2 tbsp brown sugar. 1/2 tbsp salt, 1/2 tsp cayenne, 1/2 tsp garlic powder, & 1/2 tsp pepper. Evenly rub the spice mixture on the 2.5 lb brisket to coat and place brisket in the BBQ sauce mixture in the slow cooker. Cover and cook on low until fork-tender, about 10 hours. When the beef is fork tender, remove brisket to a cutting board. Pour BBQ sauce into fat separator and then pour the sauce (minus the fat) into a saucepan. Simmer over medium heat until reduced by about half & thickened. This will take about 10 mins. Shred the meat with 2 forks and serve with the BBQ sauce. Enjoy! Between the rub and the BBQ sauce, this brisket sounds fabulous!! This sounds so good over a big pile of mashed potatoes!